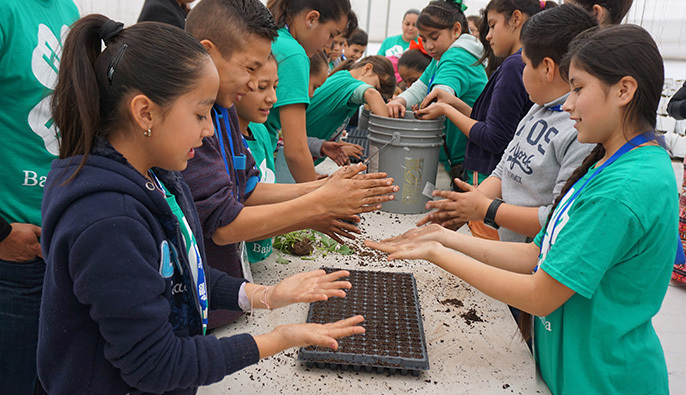 Children in Mexicali, Mexico, plant seeds while learning about food and agriculture. Over the last 100 years, the UC Agriculture and Natural Resources 4-H Youth Development Program has taught California children about food, agriculture, leadership and community service using learn-by-doing practices. To offer 4-H expertise to children south of the border, Vice President Glenda Humiston traveled to Mexicali, Mexico, to sign a memorandum of understanding with Baja California Secretary of Agriculture Manuel Vallodolid Seamanduras on Jan. 20. UC ANR Vice President Glenda Humiston and Baja California Secretary of Agriculture Manuel Vallodolid Seamanduras sign a memorandum of understanding to offer 4-H expertise to children in Mexico. Today, projects in new technologies – like drones and rocketry – join more traditional projects – like cooking, sewing, animal husbandry and farming – to give young people channels to explore a wide variety of options and interests. “We are looking into expanding to community colleges and offering education for future entrepreneurs or youth interested in skilled trades,” said Humiston, who credits 4-H with enabling her to be the first in her family to attend college. The establishment of a club like 4-H in Mexico is the fulfillment of a life's dream for Claudia Diaz Carrasco, 4-H youth development advisor in Riverside and San Bernardino counties. "We're excited to share the 4-H experience with you," Humiston told the children.